The MxPro 4 series is fully expandable from 1 to 2 loops complete with 2 on-board sounder circuits. The control panel consists of a simple to use LCD menu driven graphical interface, dual, flash based microprocessor technology driven by a 4 Amp power supply and charger approved to EN54 parts 2 & 4. Dedicated system navigation keys make this control panel user and installer friendly due to the uncomplicated, trouble free, commissioning and fault-finding. Powerful cause and effect programming coupled with dynamic zoning makes the panel suitable for a wide range of site applications, from small to large complex multi-area systems. 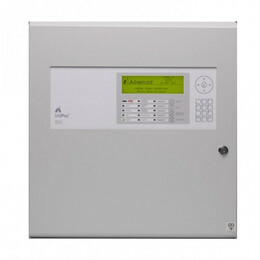 Fully on site programmable via on-board alphanumeric keypad or PC-NeT Configuration tools. An extensive suite of PC based, software programs have been developed to supplement the MxPro 4 series fire panels. Fully expandable from 1 to 2 loops via common plug in loop driver boards. Full support of Apollo (Discovery, Xplorer S90 & XP95), Hochiki ESP, Nittan Evolution and AV protocol. Advanced graphical LCD user interface with up to 1000 fire zones as standard, allowing full EN54 compliance without additional hardware or LED indication. 4 Amp power supply and charger to EN54 part 4.